Today, in Annapolis, a joint group of House and Senate Democrats gathered to discuss their discontent towards the Federal budget. With cuts in nearly every program that provides vital services to residents of our state, the group focused on the large cut to the Environmental Protection Agency, and it’s affect on the Chesapeake Bay. We have seen huge advances in the health of the watershed, and its natural surroundings. 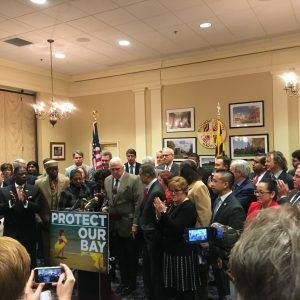 However under the current Federal budget proposal, the environmental justice cleanup, and other bay focused initiatives would be left to die. The Chesapeake Bay is not only a symbolic of the state of Maryland, but an integral part of our health, and economy.